churu is a town in the desert region of Rajasthan state of India. It is the administrative headquarters of churu District. It lies in the Thar Desert on the National Highway-65 connecting Pali to Ambala and is a junction station on the railway line to Bikaner. It is famous for the shifting sand dunes of the Thar Desert and beautiful grand havelis with marvelous fresco paintings, namely Kanhaiya lal Bagla ki Haweli and Surana Haweli, with hundreds of small windows. It also has some fine Chhatris. Near the town is a religious seat of the Nath sect of Sadhus where there are life-size Marble statue of their deities and a place for prayers. There stands a Dharam Stup, a symbol of religious equality. At the centre of the town is a fort built about 400 years ago. 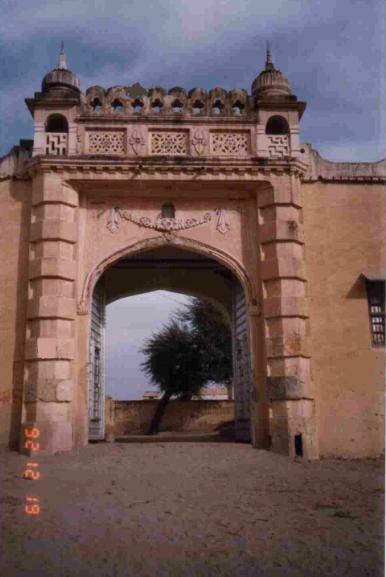 The city of churu was founded in 1620 by a Jat chieftain Churru. It was part of Jangladesh prior to annexation by Rathores. churu was ruled by Thakur Maldeo, the grandson of Rao Kandhal or Rawat Kandhal and uncle of Rao Bika, the Rathore Rajputs of Bikaner. In 1871 churu fall to Bikaner. In this battle between the forces of churu and Bikaner when all the copper and brass had been exhausted, churu Thakur asked his womenfolk to part off their silver ornaments and with this metal, shells for the cannons were made and used in the battle.Thakur Saheb Shri. Randhir Singh Ji the present Thakur Saheb of churu is Living with his family at "churu House" Bikaner. The famous temples of Salasar Balaji & Balaji Babosa are situated in the churu district.